SONOSIM SUMMARY: This article from the Annals of Emergency Medicine details a two-group, parallel, randomized trial in which operators used either ultrasound imaging or landmark techniques to obtain peripheral venous access in patients with varying degrees of venous-access difficulty. 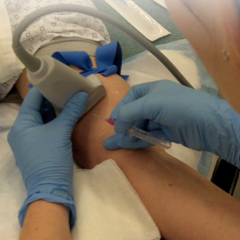 Patients were graded by the operator as difficult, moderately difficult, or easy venous-access prior to cannulation based on vein visualization and palpation. The results showed that using ultrasound to place peripheral lines was advantageous when access was graded as difficult or moderately difficult, while landmark techniques were preferable when access was graded as easy. The study supports the rationale that in situations where peripheral cannulation landmarks are absent, ultrasonography provides an otherwise-unobtainable perspective into patient anatomy. In cases where superficial landmarks are clearly present, use of ultrasound did not demonstrate a benefit over landmark-driven techniques. McCarthy ML, Shokoohi H, Boniface KS, et al. Ultrasonography versus landmark for peripheral intravenous cannulation: a randomized controlled trial. Ann Emerg Med. 2016 Jul;68(1):10-18. Randomized controlled trials report inconsistent findings when comparing the initial success rate of peripheral intravenous cannulation using landmark versus ultrasonography for patients with difficult venous access. We sought to determine which method is superior for patients with varying levels of intravenous access difficulty. We conducted a 2-group, parallel, randomized, controlled trial and randomly allocated 1,189 adult emergency department (ED) patients to landmark or ultrasonography, stratified by difficulty of access and operator. ED technicians performed the peripheral intravenous cannulations. Before randomization, technicians classified subjects as difficult, moderately difficult, or easy access according to visible or palpable veins and perception of difficulty with a landmark approach. If the first attempt failed, we randomized subjects a second time. We compared the initial and second-attempt success rates by procedural approach and difficulty of intravenous access, using a generalized linear mixed regression model, adjusted for operator. The 33 participating technicians enrolled a median of 26 subjects (interquartile range 9 to 55). The initial success rate was 81% but varied significantly by technique and difficulty of access. The initial success rate by ultrasonography was higher than landmark for patients with difficult access (48.0 more successes per 100 tries; 95% confidence interval [CI] 35.6 to 60.3) or moderately difficult access (10. 2 more successes per 100 tries; 95% CI 1.7 to 18.7). Among patients with easy access, landmark yielded a higher success rate (10.6 more successes per 100 tries; 95% CI 5.8 to 15.4). The pattern of second-attempt success rates was similar. Ultrasonographic peripheral intravenous cannulation is advantageous among patients with difficult or moderately difficult intravenous access but is disadvantageous among patients anticipated to have easy access.